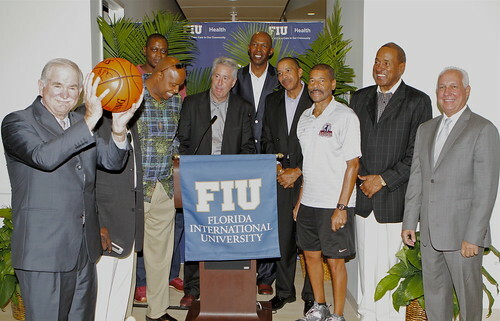 FIU Health, the Herbert Wertheim College of Medicine’s Faculty Group Practice is partnering with the National Basketball Retired Players Association (NBRPA) to provide health and wellness physicals to uninsured and underinsured NBRPA members and their spouses. The NBRPA is comprised of former professional basketball players from the NBA, ABA, Harlem Globetrotters and WNBA – more than 600 members across the country including South Florida. “When we ask our members what their needs are,” said Arnie Felkow, NBRPA president and CEO, “healthcare is at the top of their list.” According to Felkow, many former athletes, especially those who played years ago, in the days before the multimillion dollar contracts, don’t have great health care opportunities. “Through this new partnership, over the next two years, FIU Health will offer the Health and Wellness Package, at no cost, to up to 50 members and/or their spouses,” said Dr. Fernando Valverde, CEO, FIU Health Care Network. Four-time NBA All-Star Otis Birdsong, NBRPA Chairman of the Board, hopes this will encourage former players, “especially the men, who hate to go to the doctor, to get serious about their health care,” he said. In return, the NBRPA and its “Legends of Basketball” will collaborate with FIU Health and FIU Athletics in marketing and promotional opportunities. The partnership was announced Thursday, Feb. 19, at FIU Health’s main office on the Modesto A. Maidique Campus. FIU Health has a second office, the Faculty Group Practice-Broward, at Broward Medical Center in Ft. Lauderdale. NBRPA members will have access to either facility. Actually sounds like an achieving partnership.